The word “Christmas” brings popular images of Santa Claus, Carols, New Clothes, Cakes, Drinks, Dances and Feasts to the mind. All such images are expressions of celebration. But what we are celebrating is an event and message of much serious matters. 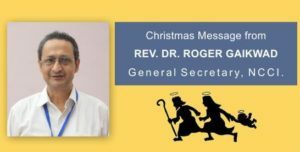 One insight on the significance of the birth of Jesus comes from the hasty migration of Joseph and Mary with the baby Jesus to Egypt. They were fleeing from the wrath of King Herod who ordered that all Jewish male children up to two years of age in Bethlehem and its vicinity be killed. The reason for this massacre was Herod’s fear that a child had been born in Bethlehem about whom some wise men predicted that he would become the King of the Jews. Herod did not want his political authority and power to be challenged and dethroned. Therefore he thought it best to nip the threat in the bud, and get the new born king killed. Since he did not know who this baby king was, he ordered that all male Jewish children up to the age of two years be put to the sword. Therefore Joseph and Mary thought it best to flee to Egypt and protect baby Jesus’ life. They became migrant refugees. Rt. Rev. 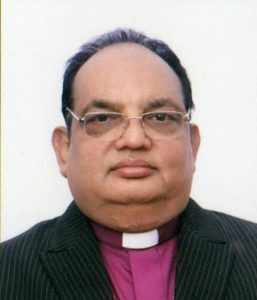 Dr. P. C. Singh – President, NCCI. In the life of States, organizations and movements decision making is an ongoing life process. History has witnessed many forms of governance and decision making. Kingship, autocracy, oligarchy, and democracy are some of them. The world has suffered from tyrant kings and reckless autocrats. Kingship has disappeared from many nations though many of the Middle Eastern countries are even now ruled by Kings and Sheikhs. For that matter, our own country emerged as a union of many small kingdoms. Of all the forms of governance, democracy has been tested and found the best form of government. Democracy is government of the people by the people for the people. Our country is world’s largest democracy. However, early church had a much simpler form of governance. They gathered together spent time in prayer and made decisions in one mind, probably guided by the elders. Their appointments and nominations were by casting lots. As the church grew up most of the mainline churches adopted democracy as their form of governance. Now CNI, CSI, MarThoma and many other churches are fully democratic. Yet, we cannot boast that our democratic process is without flaw. In many cases we fail to observe that salient features of democratic decision making process. We have come together for the annual meetings of NCCI and CSA. As President I take this time to greet you all and welcome you to these sessions of deliberations. This is also an occasion of our mutual accountability. This responsibility will be carried out officially through the reports of the General Secretary, Treasurer and the secretaries and directors who are in charge of various activities of our great ecumenical movement. What I wish to do is to take a moment to introspect and reflect on our work during the past year. This, as you know, is a spiritual exercise which will provide a focus to our deliberations. I wish to place before you a question around which we can do our introspection. How faithful and effective were we in fulfilling our quadrennial commitment of building up just and inclusive communities? We have completed sixteen months since the quadrennial meeting in Jabalpur. After observing and participating in many meetings, consultations and conversations since then, with appreciation I can say that we have made good progress in enhancing inclusivity. Let us have a look at the development of our understanding of inclusivity. About two decades ago, NCCI’s agenda of inclusivity was very traditional. 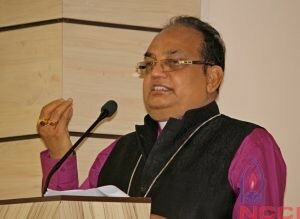 NCCI itself has been an umbrella of ecumenism for its member churches. Slowly the umbrella became larger to accommodate Roman Catholic Church and the Evangelicals with a new name NUCF. Side by side we had also occasions of dialogue with people of other faiths. Our understanding of gender equality was limited to giving equal status to men and women. Even for that, we did not succeed in giving equal status to men and women in all the member churches of NCCI. You have been giving the country very impressive slogans about its future, be it “Achhe Din!” or “New India!” Harping on “Development” you have been advocating and initiating schemes such as “Make in India”, “Skill India”, “Start-up India”, “Digital India”, “Smart Cities”, etc. However many people who belong to your government, party, and other likeminded bodies give us a different picture of Achhe Din and of New India where the values of Justice, Liberty, Equality, and Fraternity are stifled. “Vigilantism” has become a popular methodology of such persons and bodies. https://ncci1914.com/wp-content/uploads/2017/04/letterclipartpmo2.jpg 260 255 Caesar David http://ncci1914.com/wp-content/uploads/2018/05/NCCILOGO105-300x72.png Caesar David2017-04-14 07:59:522017-04-14 08:01:37Open letter to The Prime Minister of India.